Xi'an. Tours to China. Travel to China. China. Legend tour. Xi'an, known as Chang'an in ancient times, is the capital of Shaanxi Province with a population of 2.02 million. Xi'an is one of the famous historical and cultural cities in China. 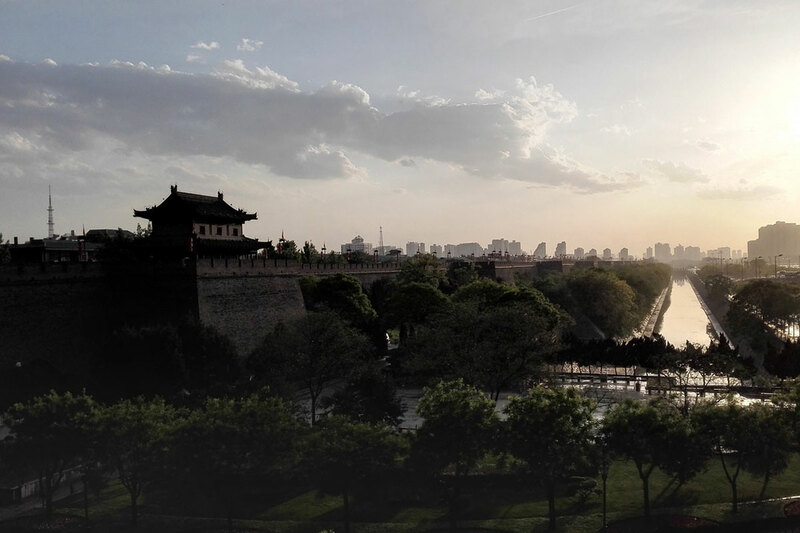 With a history of over 3,100 years, Xi'an ranks first in the seven ancient capitals in China and is known as one of the four major capitals with ancient civilization in the world together with Ancient Rome, Athens and Cairo. 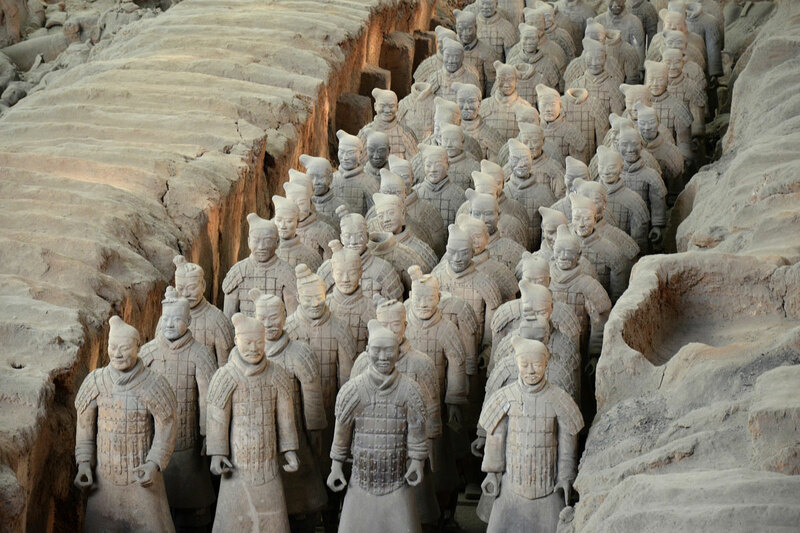 Xi'an is rich in tourism resources and embraces 98 historical monuments and cultural relics, more than 4,000 ancient ruins, mausoleums and tombs, and 120,000 unearthed cultural relics under city protection. Many of them are rare in China and in the world as well. The terra-cotta warriors, horses and bronze chariots of the First Emperor of the Qin Dynasty (221-207 B.C.) unearthed in the eastern suburb of Xi'an in 1974 made a sensation at home and abroad, and were named as the "Eighth Wonder of the World." Shaanxi History Museum. Situated to the west of the Greater Wild Goose Pagoda and covering an area of 70,000 sq. meters, Shaanxi History Museum, with a total floor space of 56,000 sq. meters, is one of China's first museums with modern equipment. The whole collection of the museum vividly reflects China's ancient history from the primitive society to the Tang Dynasty. The museum also provides such facilities as reference rooms, shopping centers and restaurants for tourists. 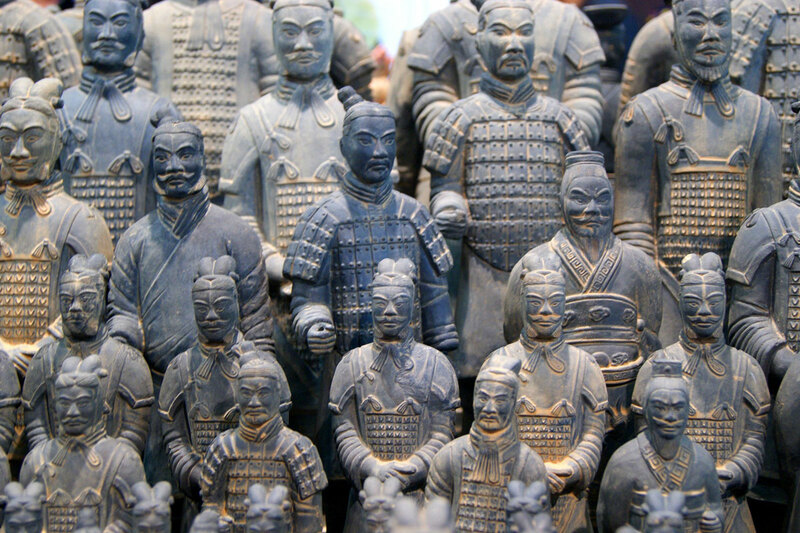 Museum of the First Emperor Qin Shihuang's Terra-cotta Warriors and Horses. 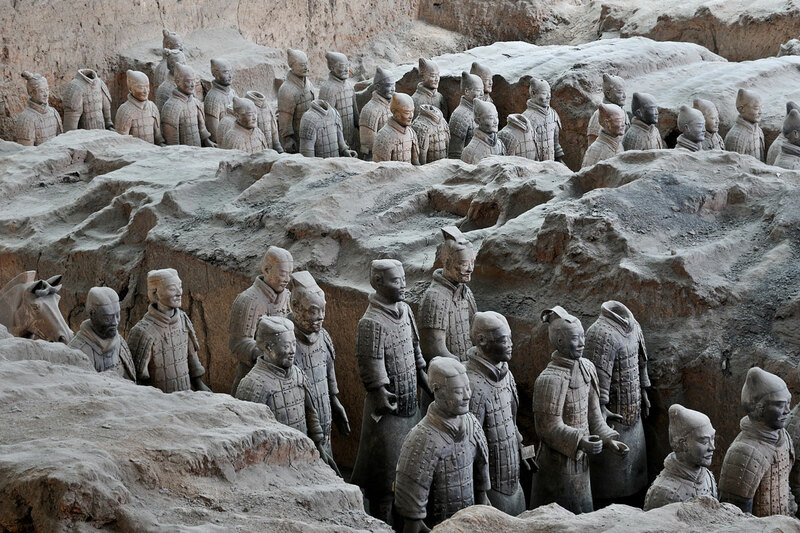 The museum is 1.5 km away from the Mausoleum of the First Emperor Qin Shihuang. The 14,629-square-meter Pit 1 was excavated in 1975. 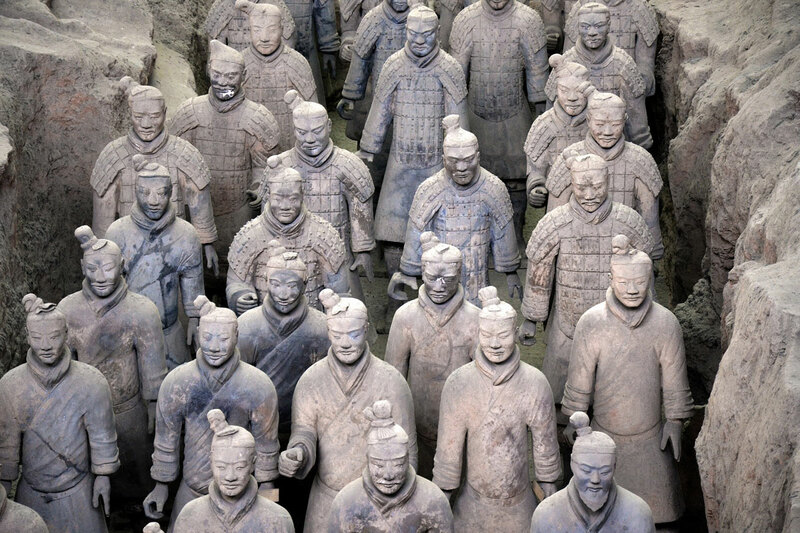 The 6,000 life-sized terra-cotta warriors and horses are acclaimed as the "eighth wonder of the world." In the pit bronze swords, crossbows and other weapons were found, all well preserved. Mausoleum of the First Emperor Qin Shihuang. 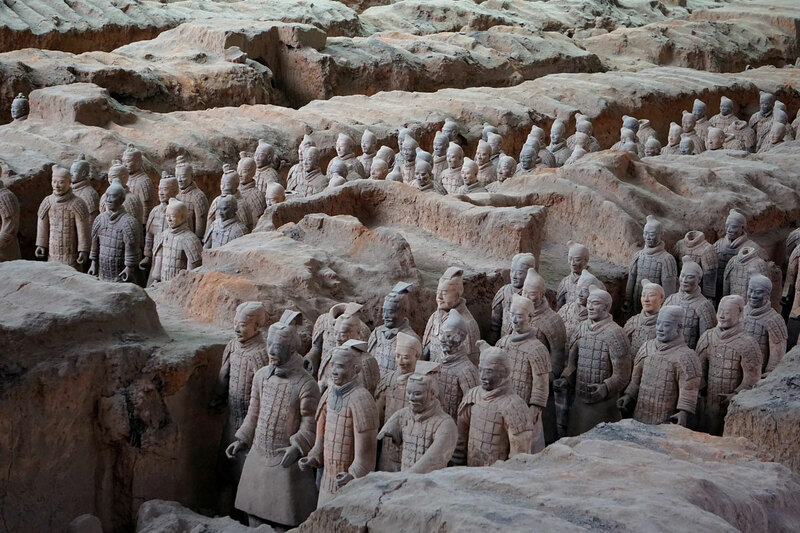 Located 5 km away from Lintong County seat is the mausoleum of China's first emperor Qin Shihuang (259-210 B.C. ), who was the first to unite the country. The construction lasted 37 years. The tomb is 76 meters high and has a circumference of 2,000 meters. Surveys show that the mausoleum is composed of inner and outer cities. The inner city has a circumference of 2,525 meters, the outer, 6,264 meters. In 1987, UNESCO inscribed it on the World Heritage List. City Wall. 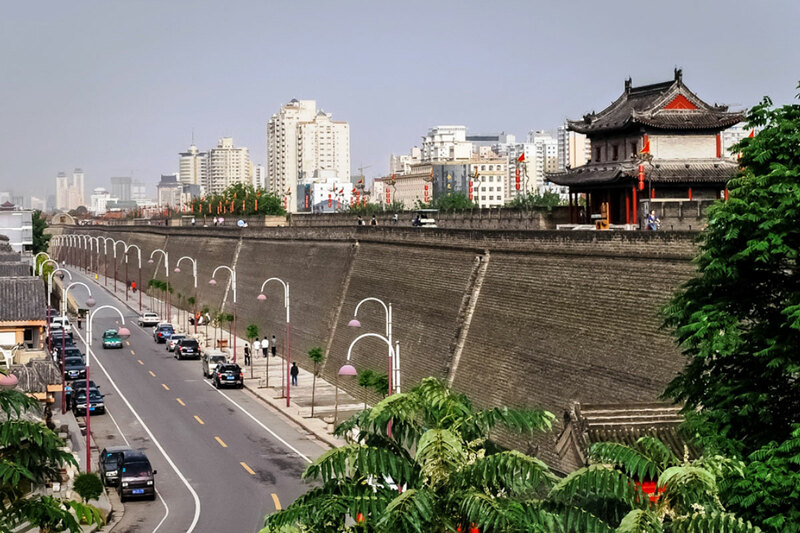 Built during the Tang Dynasty when the city, Chang'an, was capital, the wall is the only complete city wall extant in China. 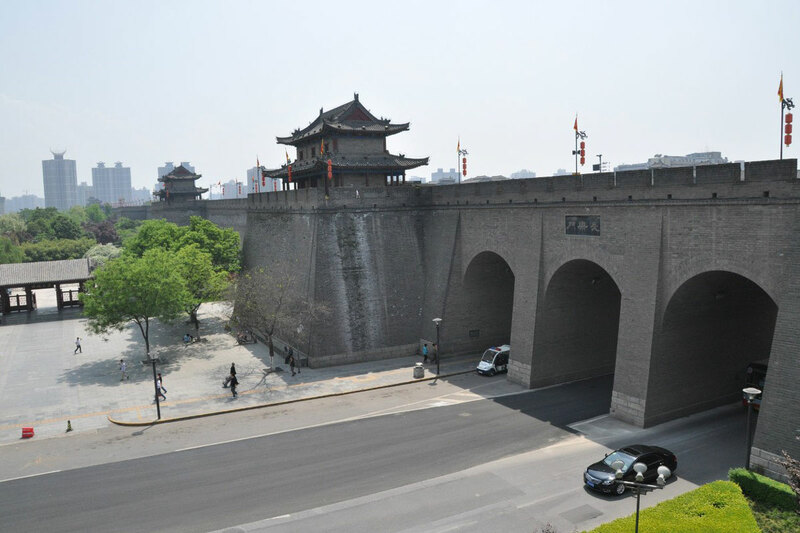 The rectangular wall is 11.9 kilometers long, 12 meters high, 12-14 meters wide on top, and 15-18 meters wide at the base. There are 5,894 crenels along the exterior wall, but no crenels on the interior side. Turrets are at the four corners. Each side has a gate. On top of the gates are main towers and watchtowers. A moat protects the perimeter. One can take a walk on the wall or go fishing by the moat. Huaqing Hot Spring. Situated at the foot of Lishan Hill, the hot springs have been famous since ancient times. Called "Star Pool" in the Zhou Dynasty 2,800 years ago, it got its present name in the Tang Dynasty (747). A large scale construction in 1959 recreated tens of palace-like buildings and imitation of Jiulong Tan (Nine-Dragon Pool). 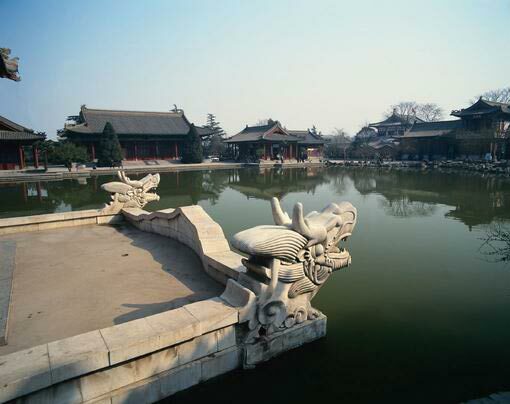 In 1990, the "Museum of Huaqing Palace Imperial Pools" was opened. Made up of the Lotus Flower Pool or Imperial Pool, Crab-Apple Pool or Guifei (Concubine) Pool, Star Pool, Staff Pool and Prince Pool, with a floor space of 1,800 square meters, it has regained its magnificence in the heyday of the Tang. The Greater Wild Goose Pagoda. 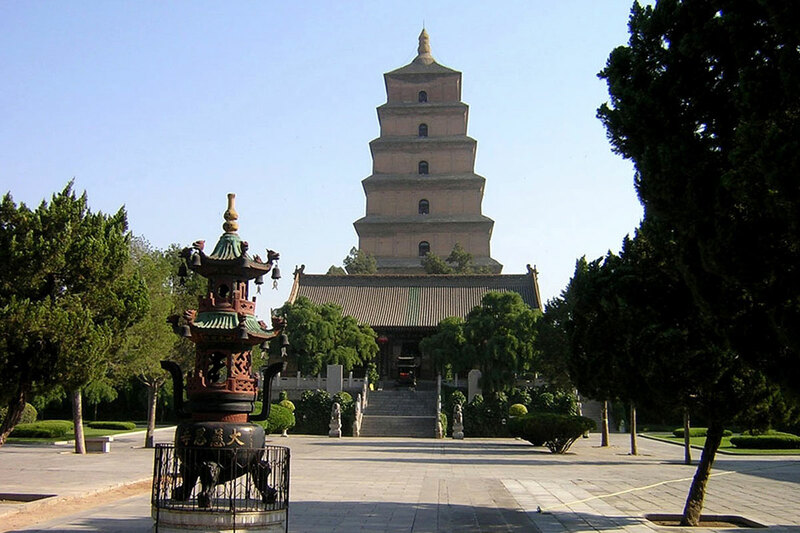 The pagoda in Ci'en Temple in the south of Xi'an is the symbol of the city. It was built in 652 in the Tang Dynasty to safekeep the 657 volumes of Buddhist scriptures brought back from India by Monk Xuan Zhuang. 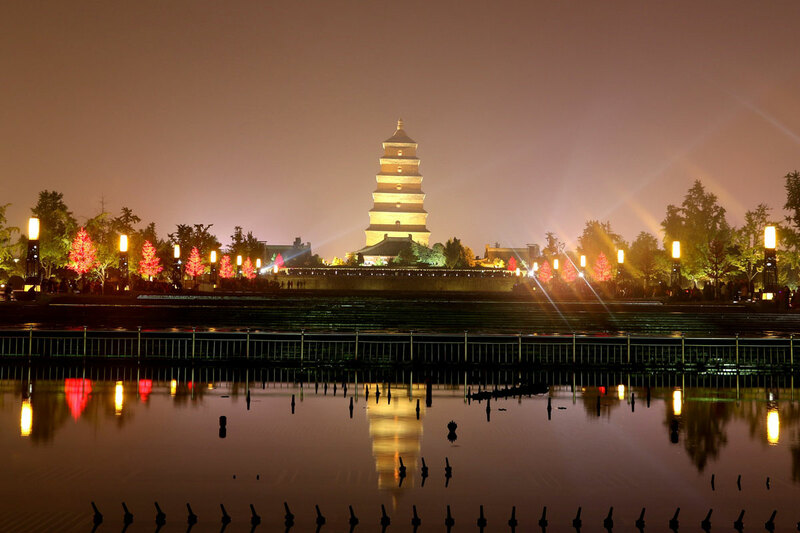 The seven-storied, 59.9-meter-high pagoda is pyramidal with each side of the ground floor 25 meters in length. Famen Temple. Situated in Famen Town north of Fufeng County, this famous temple was built in the Eastern Han Dynasty to safe keep finger bone relics of Sakyamuni. There are many precious objects. The four relics of Buddha's finger bones have been appraised to have belonged to Sakyamuni. Altogether there are more than 2,400 pieces of gold and silver wares, glazed wares, porcelain and pottery wares, jewellery and textile products of the Tang imperial court. Lianling Tomb. Lying on Liangshan Hill north of Qianxian County is the joint mausoleum of Tang emperor Gaozong (Li Zhi) and his consort Empress Wu Zetian. It once had two walls, but now only the inner wall and Xi'an Hall remain. 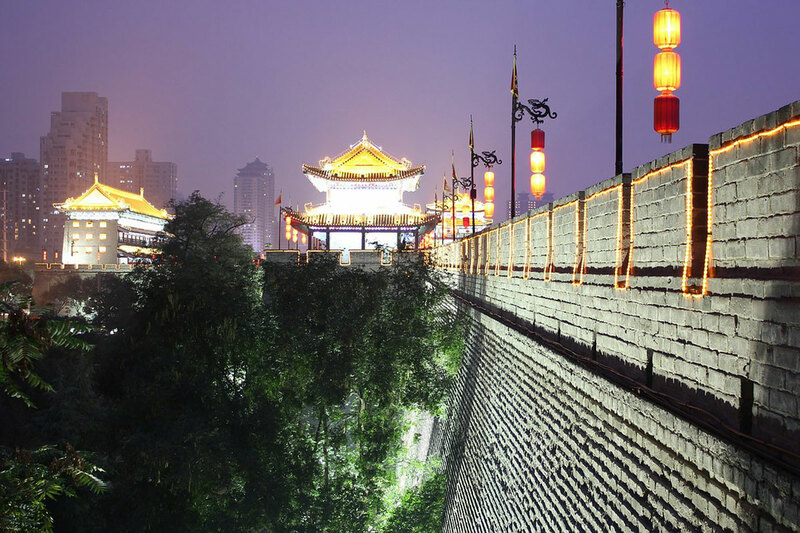 The wall is 5,920 meters long and 2.4 meters thick, with gates and giant stone carvings. The stone carvings near the South Gate are still in good condition, including huabiao (cloud pillars), birds and animals, 6.3-meter-high stone pillars and 61 stone statues of foreign envoys and chieftains of national minorities who attended the funeral of the emperor. Forest of Steles. This is the largest stone library in China. It was built in the former Confucian Temple at Sanxue Jie (St.) in Xi'an in 1090 to preserve "the Kaicheng Stone Classics" and "the Stone-Based Classics of Filial Piety" engraved in the Tang Dynasty. There are six exhibition rooms, seven galleries and a stele pavilion where about 2,300 steles and tablets of past dynasties since the Han are stored. The Mosque. Situated in Huajuexiang in the northwestern corner of Xi'an, the mosque, also called Huajue or Dongda Mosque, was built in 742. It is one of the four big ancient mosques in China. The mosque faces east and has a floor area of 4,000 square meters. The grounds cover an area of 12,000 square meters. Maoling Tomb. Fifteen kilometers east of Xingping County is the mausoleum of Emperor Wudi, Liu Che (156-87 B.C.) of the Han Dynasty. The construction lasted 53 years. It is the largest imperial tomb of the Western Han Dynasty, with abundant luxurious funerary objects. Banpo Museum. Located north of Banpo Village in the eastern suburb of Xi'an is the 6,000-year-old Banpo Site. It was a typical matriarchal clan community in the Yellow River Valley. Covering an area of 50,000 square meters, it includes a residential area, a pottery area, and a burial ground.